With 169 guest rooms, 19 suites and 18 Four Seasons Private Residences, Montreal’s Four Seasons is an emblematic place where sensuality meets intelligent design and where guests are invited on a journey of discovery through enchantment and inspiring social connections. 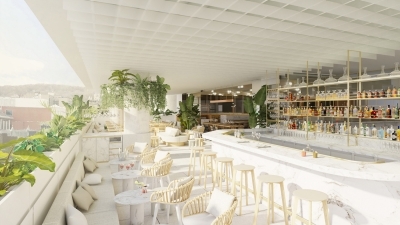 In this noteworthy update, Four Seasons Hotel Montreal and the onsite MARCUS – the debut Canadian restaurant by visionary Chef Marcus Samuelsson – are confirming reservations for dates beginning May 8, 2019. The Social Square includes the new MARCUS Restaurant + Terrace and MARCUS Bar + Lounge, celebrated Chef Marcus Samuelsson’s brasserie concept. Open daily for breakfast, lunch and dinner, focal points will be sustainable seafood, a raw bar, local vegetables and grains as the culinary team works closely with local producers and growers. The Hotel will enchant guests around the clock with world-renowned Four Seasons services including special programs for parents and pets, and luxury valet service so guests arrive in style. There’s a 24-hour fitness centre by celebrity trainer Harley Pasternak, skylit indoor pool, sauna and luxurious spa (including fully private VIP rooms). The Hotel’s stunning 450-person Palais des Possibles ballroom features a sweeping terrace overlooking Montreal. Blending intelligent design with sensual, sumptuous materials, guest rooms have both drama and class, with floor-to-ceiling windows, chaise longues and remarkable free-standing bathtubs (in certain rooms).